Jon Jones (red gloves) and Anthony Smith (blue gloves) during UFC 235 at T-Mobile Arena. 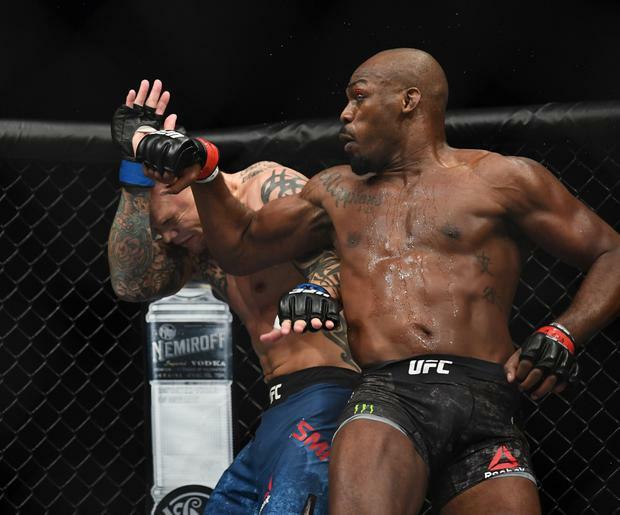 UFC light heavyweight champion Jon Jones cruised to an easy victory over Anthony Smith and Kamaru Usman became the first African-born champion as he defeated Tyrone Woodley for the welterweight title at the T-Mobile Arena in Las Vegas. Smith lived up to his "Lionheart" nickname, surviving five gruelling five-minute rounds against one of the most dominant fighters of all time, but the judges gave the reigning champion a comprehensive victory at UFC 235. "I wanted to win it, I didn't want to steal it," Smith said in the cage. Despite Usman's dominance and a late fourth-round flurry that rocked Woodley badly, the fight was decided on the judges' scorecards 50-44, 50-44 and 50-45 to crown the first African-born UFC champion.